The investment community isn’t pushing the panic button on Macau – at least, not yet. Gaming numbers for the market during September came in far below expectations. 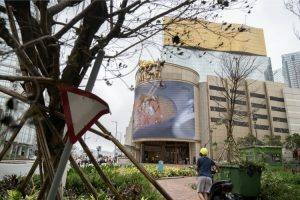 However, the powerful Typhoon Mangkut that shut down the region’s casinos for 33 hours – the first such closure in Macau’s history – didn’t help. Union Gaming Group analyst Grant Govertsen said the stoppage cost operators upward of $186 million in revenue. Still, Macau casinos reported $2.7 billion in gaming revenue for September, a 2.8 percent increase, well below the typical double-digit monthly increases the market has seen since 2016. “With the benefit of hindsight, and in the context of the damage in Hong Kong being much more severe than it was in Macau, we believe the period of time that was needed to get casinos back to normal extended well beyond the Monday morning re-openings after the mandated closure,” Govertsen, who is based in Macau, told investors in a research note Monday. Govertsen also pointed out that Macau gaming revenue is up almost 16 percent for the first nine months of 2018. On Monday, after the results were posted, there was little reaction among investors, and what movement there was primarily involved the Nevada-based casino companies which have the largest holdings in Macau. The stock price for MGM Resorts International was down 3 percent and Las Vegas Sands’ shares were up less than 1 percent. Wynn Resorts was down 1.4 percent, but that’s due to other factors, such as uncertainty in Massachusetts over the Encore Boston Harbor licensing and the excess noise surrounding the company since sexual harassment allegations earlier this year drove founder Steve Wynn out of the corporate offices – and out of the company – earlier this year. Macau is important to the bottom lines of Sands and Wynn. The companies derive between 65 percent and 70 percent of their quarterly revenue from the region. MGM is far more U.S.-centric, with Macau providing roughly 25 percent of its quarterly numbers. Jeffries gaming analyst David Katz said the lowered results from September’s typhoon won’t impact the companies’ stock prices as much as upcoming management commentary on market dynamics during third quarter earnings reporting this month and in November. Katz said investors are more focused on the casinos’ continued business relationships with high-end players and mass-market customers, and discussions about the upcoming re-bidding process to retain their concessions (i.e., gaming licenses). Still, there is trouble in the waters surrounding Macau, which remains the world’s largest gaming market. Last year, Macau hit $33 billion in gaming revenue, its first annual increase since 2013, when the region hit an all-time high of $45 billion. Macau is in the middle of its Golden Week, a Chinese National Holiday. The event is usually an indicator of how the rest of the month will trend. Bloomberg News reported on Monday that just 40 percent of Macau’s 3-star-to-5-star hotel rooms had been booked going into Golden Week. Last year, 80 percent of the rooms were booked. Deutsche Bank gaming analyst Carlo Santarelli expressed caution Monday, saying that, given the declining run-up numbers for Golden Week, October is going to be tough to forecast. The soft September numbers caused by the typhon won’t help with predictions. “Over the last six years, October win per day has been roughly 14.9 percent stronger than the win per day in September,” Santarelli told investors Monday. Analysts are still leaning toward gamblers returning to Macau in October. Nomura Instinet’s Harry Curtis expects Macau to see a 5 percent to 10 percent gaming revenue increase in October, with Golden Week demand bouncing back. Santarelli also predicted a 5 percent increase in October. “As we move into Golden Week, we remind investors that the early stages are traditionally slow,” he said. Govertsen said there is “clearly concern in the air” over the Chinese economy taking a nosedive. However, he said Macau executives who were on the ground during challenges in 2008 and 2009 and the 2014 and 2015 crackdown on junket operator corruption by the Chinese government don’t believe they are seeing anything “reminiscent” of previous downturns. “Of course, this doesn’t mean that Macau is definitively safe, but what casino operators are seeing today doesn’t suggest to them that growth is on the cusp of turning negative,” Govertsen said.